Love, Mrs. Mommy: Learning & Keeping Clean With The My Bright Family Disposable Placemat! 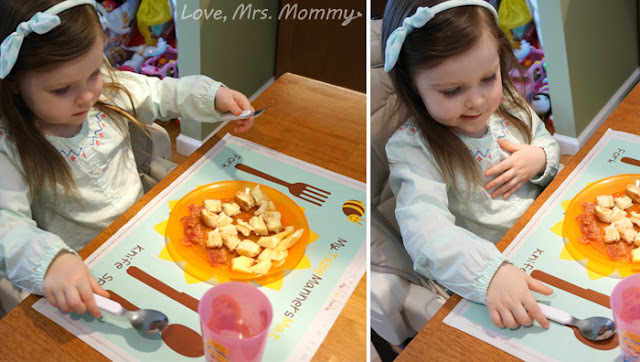 Learning & Keeping Clean With The My Bright Family Disposable Placemat! I received these placemats at no cost to facilitate this review. All opinions are my own. The post contains affiliate links. Teaching our children to be polite and have manners is very important. From the time my daughter was very little (yes, even younger than now, hehe), I always made sure to incorporate “please” and “thank you” into her daily routine. Now that my daughter is older, there is this great placemat to help teach her how a place setting looks and helps keep her place at our table clean. 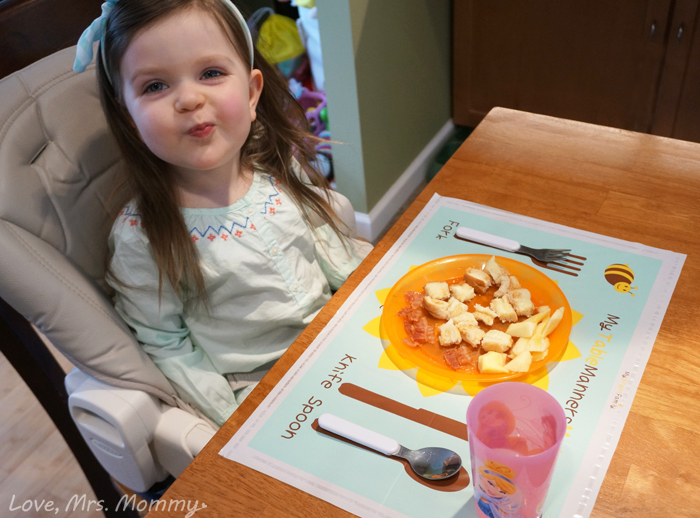 This adorable and very helpful placemat was made by My Bright Family, and was definitely a bright idea! 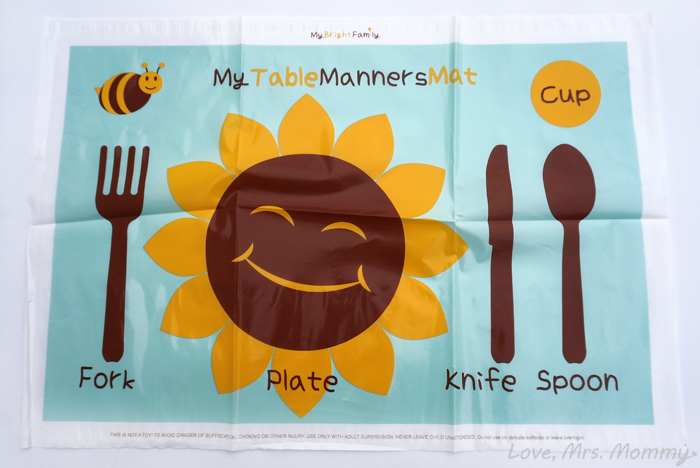 The MyTableMannersMat® by My Bright Family is a disposable placemat designed to stick to any eating surface. It helps to protect your children from germs and messes. It’s also a great tool to teach your little one how a place setting looks, as well as the name and spelling of each item. 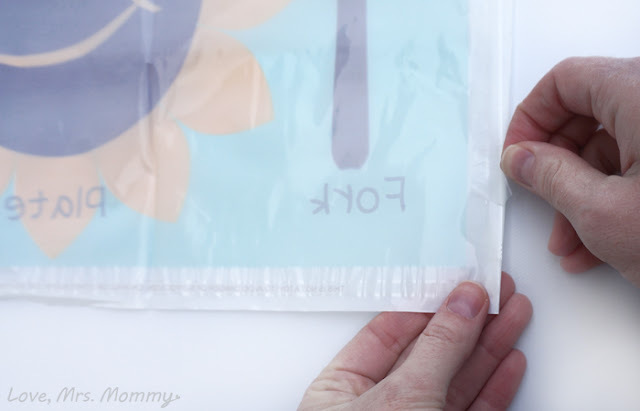 Each pack of placemats includes 60 individually-folded disposable placemats that you can just grab and go! Great for going out to a restaurant, as they will keep your child protected from germs. It will also keep them entertained at the table, which you gotta love! On the back of the placemat there are easy to peel off adhesives (one on each side) and they make for easy and solid placement on a table. I used one at our kitchen table for two days before replacing and it didn’t leave any sticky residue or mark on our table. When I saw these, I knew I was going to like them, but I had no idea just how much my daughter was going to love them! She has the best time picking up her utensils, plate and cup and putting them back in their appropriate spot. The first time we used it, she asked me what it said on each location and when I told her, that’s all it took. After that, she was a pro! She was placing her dinnerware on the right spot every time. An unconventional, but also very helpful use for these, would be an emergency diaper changing mat. When you are out with your little one and there is an unexpected leak (and you need a pronto diaper change! ), just use one of these mats as a clean surface. You and your sweetheart will be back in business in no time! This disposable placemat is such a wonderful and handy item. It’s perfect to store in the car, your purse, diaper bag, etc. After all, you never know when you might need one! Connect: Find out more about My Bright Family by visiting their website. Then make sure you “like” them on Facebook and follow them on Instagram. 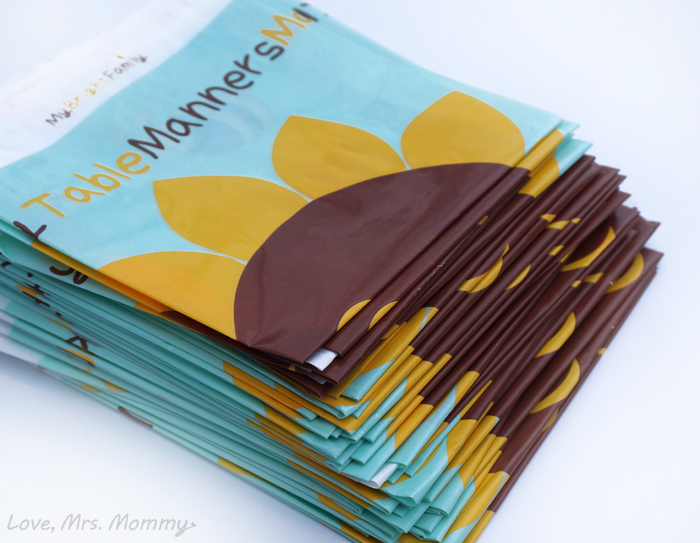 Buy It: You can purchase a 60 pack of MyTableMannersMat® by My Bright Family on Amazon for only $9.99! The cuteness level is through the ROOF! As is the usefulness! Love it! How adorable are these? Kids will learn how to correctly set a table and feel like a grownup. These are so cute and fun. Thank you for sharing. These are so smart! Definitely the perfect thing to stash in the diaper bag to use when eating out or at someone else's home. I love the cute design, too! This is so cute. This is a great idea. Thank you for sharing. These are so cute! My cousin would love them. I've never seen these before, I love it! It seems like a great teaching tool for meal time. How nice. My mother made sure we always set the table in the proper way. Adorable and great for on the go! THis placemat is very useful and also very cute. Awesome concept as long as the kids don't become to preoccupied with the placemats. So adorable, they will learn as they eat.